Thomas Cook China is to expand its hotel portfolio in the Far East with two additional projects, including the first Asian hotel in the operator's boutique Casa Cook brand. 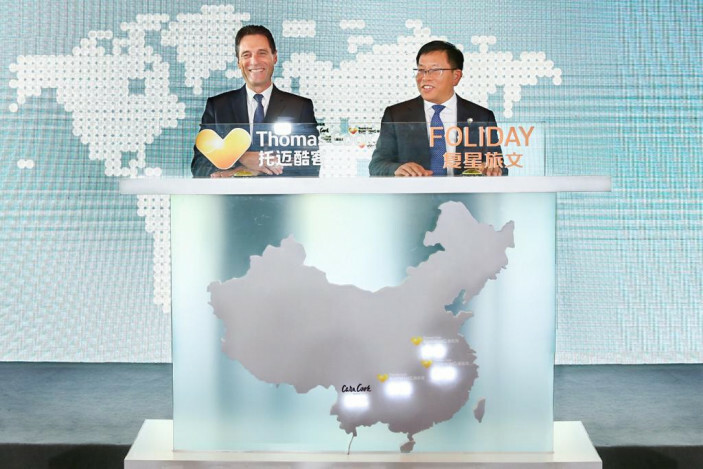 Thomas Cook China is a joint venture between Thomas Cook Group and Chinese developer Fosun. In a ceremony in Shanghai, Thomas Cook Group CEO Peter Fankhauser and Fosun tourism executive director and CEO Jim Qian, signed memorandums of understanding for the development of a Casa Cook and a Thomas Cook Sunwing Family Resort in Lijiang in southwestern China, and Taicang near Shanghai, respectively. The two properties follow previously-announced projects with DreamEast Group, a leading tourist resort development company listed in Hong Kong, for two Thomas Cook Sunwing Family Resorts, in Jiashan near Shanghai and Hengyang, in southern China. The operator says that, through partnerships and its own distribution channels, it will become comparable in size to Thomas Cook's other key source markets. The Lijiang and Taicang resorts are Fosun Tourism's flagship development projects. Lijiang is a 350,000 square metre development in Yunnan province in southwest China targeting mid-to high-end customers, and includes a Club Med resort. The Taicang project includes 145,000 square metres of development land in Taicang city, 30 minutes from Shanghai. Both destinations are expected to open in late 2020. Thomas Cook Sunwing Family Resorts has a portfolio of 200 hotels under eight brands across Europe, Middle East and Asia, including Casa Cook and Cook's Club. Fankhauser said: "By partnering with Fosun to develop two flagship new hotels that will be managed through our joint venture, we're making the most of our relationship to give Chinese customers a holiday experience that's very different to what's on offer from the competition. "It's especially pleasing to be realising our long-held ambition to work with Fosun to launch own-brand hotels, which form the core of our group strategy for profitable growth, here in China."